We made some videos that illustrate some of the challenges of not being yourself when drinking wine. Please take heed, and keep your pinkie down. Come back here, or follow us on Facbeook or Instagram if you want to know when the next videos are released. Cheers! A common wine enjoyment "boobytrap"
We know you have one (everyone does), find it below or contact us! Union Wine Company began with one goal, make great craft wines that are affordable and accessible. More wine, less fuss. We quickly began checking off the must-haves. Great wine? Check. Affordable pricing? Check. Accessibility? Well, this is where things got fun. We talked about what it would be like if you could bring a nice wine anywhere, literally, you know, just ‘grab a six-pack and go’ kind of thing. And, the idea of the can was born. The cans were first released in a limited edition at the 2013 Feast Portland event through a Pinkies Down campaign to share our belief that it’s more important what goes into the glass than what type of glass it is. We also introduced the Union Wine Co. Tasting Truck, where we served wine in a can. Based on the success of that weekend, we decided to put our idea into full production. WHERE CAN I BUY UNDERWOOD WINES IN A CAN? Prop up your feet and pop open a Pinot tonight. You can buy our fine canned wines in over 45 states, and in a few other countries as well. Just plug your locale into our wine finder to locate a store near you. If we aren’t in your area yet or you prefer delivery, you can also order online . We’re constantly expanding, so make sure to follow us on Facebook and Instagram to see what’s new. How many “glasses” of wine are in a single Underwood Can? DOES THE ALUMINUM CAN AFFECT THE TASTE OR CONSISTENCY OF THE WINE? Not at all. As with all canned beverages, there’s a liner in the can that prevents the aluminum from contacting the wine. Order one of each – the bottle and the can – invite some friends over, and dispel the myth for yourself. WHAT is Better for the environment: cans or glass? Cans are the most recycled beverage containers in the world and are 100 percent recyclable. They can be recycled infinitely with no loss of quality through a well-established and efficient process. Each recycled can reduces our environmental footprint. Cans are also ultra-efficient to transport, lightweight, unbreakable, and provide superior product protection. WILL THE WINE CONTINUE TO AGE AND DEVELOP IN A CAN? Yes, but it will probably have less influence from light and air since it’s sealed, so it should actually last longer. WHAT are the “BEERIFICATION OF WINE” AND “PINKIES DOWN” Campaign? The craft beer movement borrowed a lot from wine packaging as it came of age and continues to take it to whole new places. We want to shift our focus back to something that’s rooted in craft but less stuffy. 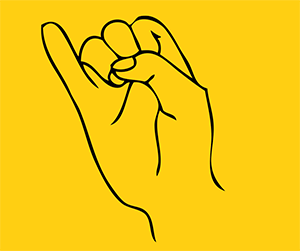 #Pinkiesdown is how we communicate that big idea. Having a glass of wine with friends should be fun and easy. Pinkies down, people. WHY IS OREGON A GREAT PLACE TO MAKE WINE? Part of what makes winemaking in Oregon exciting is that it’s a constant challenge with lots of rain, cool temps, and a short growing season. But, it’s also what sets Oregon wines apart. We’re not France. We’re not California. Oregon wines have a distinct profile. They have good vibrancy and crispness. Our wines taste like the agriculture that surrounds us. Then, there are the people — slightly crazy, pioneers, artists, makers, and doers that believe there is always a better way to do things. We are constantly inspired by the natural beauty of the Northwest and the ethos and passion of its residents. We do not have a formal tasting room, but please feel free to email us at info@unionwinecompany.com to arrange for a private visit. We also have the Union Wine Co. Tasting Truck, which is currently used for events. Stay tuned by checking unionwinecompany.com’s road trip page and by following us on Facebook and Instagram .